Boracay Island is 5 hours away from where I used to live. Living in Iloilo City gave me the opportunity to visit the island frequently. Perhaps seeing the Boracay sunset several times has made me care less about it. However, my recent visit to Boracay last April was different. The sunset was too beautiful to ignore. Boracay may have become very polluted, but the beauty of its sunset remains as splendid as ever. 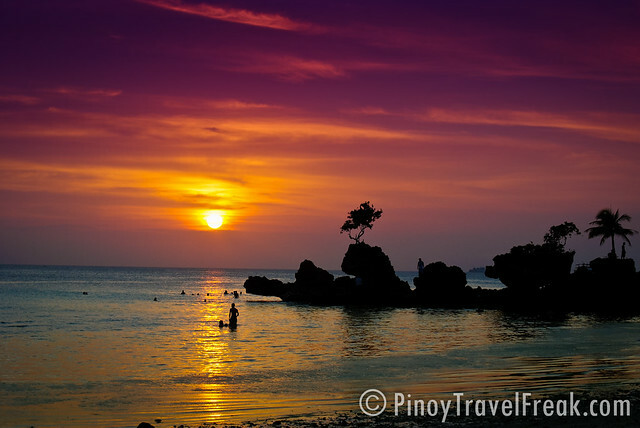 No wonder the sunset of Boracay is a perfect post-card picture for the caption - The Beauty of the Philippines. Which I believe perfectly fits for every sunset shot of Boracay beach. 5-star stunning picture you catch! I love the play of colors. Nice. I didn't know you live in Iloilo. I was there few days ago. Natuwa ako kasi nung bumaba ako sa Ortiz Port ang sinisigaw ng mga tao "Boracay po! Dito o!" hahah! It was tempting. 4 hours lang pala siya. "Guimaras lang po ako manong".. sabi ko. Tapos dinedma na ko. hahah! Nakakainggit ang hometown mo Gabz. Never been to Boracay. Kahit kelan mo pala gustuhin pwedeng pwede. Nice shot! Sites looking great Gabz! Keep up the good work! Ay sayang! Rainy season na kasi ang July eh, tsaka malas nyo lang may bagyo. Hehe! Bench Press Exercise: The bench press exercise helps in toning the pectoral muscles (pecs).